I had a few people over on Saturday night and made a huge bowl of guacamole. It was delicious and my friends devoured it, but I totally overshot the amount of chips I would need. This morning as I cleared away the empty beer bottles and glasses, I fretted about what I would do with the huge bowl of blue corn tortilla chips that had already begun to go stale. The solution? Chilaquiles, the traditional Mexican dish of corn tortilla strips, salsa, and eggs. Normally we don’t specify brand names, but the Frontera brand salsa is really spectacular and makes a big difference in the flavor of the dish. Pour salsa plus 1/2 cup water in a large, deep skillet and heat over medium heat. Add the chips (it helps to break them up a little bit as you add them). Move the chips around with a spatula a little to ensure the salsa-water mixture coats all the chips. Allow to cook over medium heat, stirring occasionally for 6-7 minutes or until the chips begin to soften. Once chips have softened, add the eggs, cilantro, scallions, and jalapeno. Stir to incorporate all ingredients and finish cooking as you would scrambled eggs, stirring occasionally. Just as the eggs have set (it should take 6-7 minutes), lightly fold in the shredded cheese, salt and pepper. 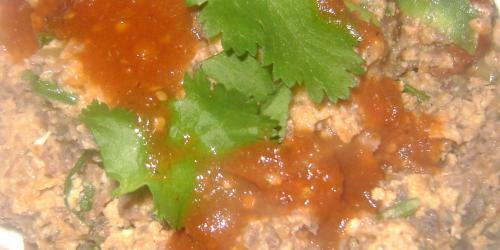 Serve garnished with additional cilantro and a little extra salsa, if desired. Oh yum! I totally had the same problem with guac and chips this weekend. This sounds super delicious and easy – I can’t wait to try out the recipe! Your blog information is nice and friendly. This post is very helpful for me. Thank for post. Congrats on having such well managed site! It has good looks and contains informative content as well.